Merrowing on a patch is the very thick outside edge of a patch. While there are some styles of patches that are not merrowed, most of the patches should be merrowed. The merrowing adds a professional finished look to the patch, and it also covers up any freyed edges or mistakes in embroidery. 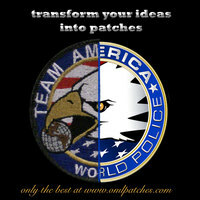 At OMLpatches.com, we also take everything much further in the interest of high quality professional patches. We merrow the velcro directly onto the patch itself. This is a HUGE BENEFIT for the longevity of your patches because it ensures that the velcro will NEVER EVER separate from the patches. Ever. Merrowing the velcro onto the patch is a time consuming process - most companies skip this process and simply merrow the patches and then quickly sew the velcro on to the patch. This leads to a few errors - for one, there is only one thread that is holding the velcro to the patch - and this will eventually and rather quickly come apart and that makes your patch useless without the velcro. The other part that we notice is that you can clearly see the sewing lines - yucch - and they either enter on to the patch itself or they go through the merrow. Neither of these are good - they take away from the patch - and usually look very messy. If you don't like the stitch lines or they start to come unravelled - there is not much you can do about it. You could sew the velcro back on to the patch, but you wil have some issues - if you try and sew it, you will break many many needles - basic sewing machines are not made to go through material, embroidery and velcro at the same time. You will also break many threads - we use special merrowing threads and embroidery threads which are stronger and thicker than regular thread. color matched edge - we use the same thread for the merrowed edge of the patch so everything matches perfectly. OMLpatches.com has been making professional quality awesome custom patches for the last 8 years, and we stand behind our patches. Patches have been field tested in many different countries for years, and the merrowing has never failed, and the velcro has never come off of any of our patches. If you want high quality patches with a professional merrowed edge at no extra charge, and patches that are made to last through thick and thin, then chose an OMLpatches.com patch - you can't beat the quality! OMLpatches.com - custom made patches, made to last.